If you’ve been a victim of one of the recent fires in Colorado Springs (either the Waldo Canyon or Black Forest fire), you may still be reeling from the traumatic experience, wading through all the paperwork, financial documents, and the insurance claims process. 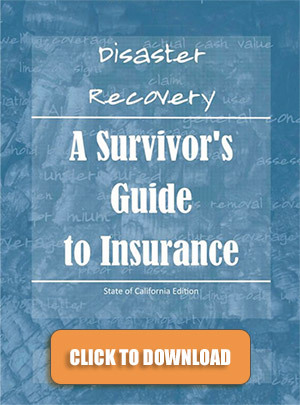 If so, here’s a free resource we wanted to share which we think you’ll find to be helpful: it’s called “Disaster Recovery: A Survivor’s Guide to Insurance,” and it’s a helpful 126-page guide created by CARe (Community Assisting Recovery). CARe is a group from California that created this guide to help victims of the fires that frequently break out in the San Diego area. But we’ve been able to give this guide to people in Colorado Springs who’ve either lost their homes or have had partial damage due to the Black Forest fire and they’ve found it to be quite helpful. So feel free to download the PDF by clicking here. Let us know what you think! We hope you find it helpful. What Kind of Policy Do You Have? What is Depreciable in the Dwelling Coverage?